Image: The Sutton Hoo helmet, replica. Public Domain via Wikipedia Commons, by Gernot Keller. Further details. I am quite sure you thought I had been sucked into some terrible temporal wormhole, and found myself floundering in a sixth-century Danish feast hall, fighting off anthropophagous monsters, and descending into drunken depravities with boar-helmeted warriors. Fear not! I have merely been inundated with monkish responsibilities which have so overwhelmed me that I have been unable to offer my dear readers their regular prescription of spiritual succour. Or something like that. Well, let me make amends. One of the things I have been doing during my imposed blog exile is reading a rather interesting book about the Germanization of early medieval Christianity,* recommended to me by a friend of Dr Monk, the slightly odd fellow that claims to be the real brains behind this website. Well, notwithstanding her Wiccan heritage (one has to compromise now and again), I must thank Linda Sever for directing me to this fascinating work, for I believe I can draw upon it to bring you all the spiritual uplifting you could possibly desire. The premise of this study by James C. Russell, or my rather simplified interpretation thereof, is that Christianity met with an initial resistance in Germanic lands of the early medieval world (we’re talking here roughly of the sixth century onwards), and that it only eventually succeeded because the Church adapted its message to the values of those stout-hearted peoples. It would seem, he argues, that there were a few compromises here and there over doctrinal matters, and the Church felt the need to emphasize Christ’s position as a warrior king. Well, I never! I’m paraphrasing here, but Russell explains that the early Germanic peoples had extremely strong familial and community ties, accepted the world for what it was, and were not big into the idea of personal salvation. So the core doctrine of Christianity, namely that Christ died for us to redeem us from sin, was not, shall we say, the most impressive message to take to the lands of the North and West. As an Anglo-Saxon, I haven't the foggiest what 'sociobiological' means, but from the rest I can see that Russell is arguing that there was a distinct difference between Germanic and Christian values and ideals. In other words, the emphasis on honour, wealth, influence, and power within Germanic society inhibited the spread of Christianity. The Church had to adapt. In reality, Russell persuades, it was as much a case of Christianity being Germanized as it was of the Germanic peoples and customs being Christianized. I must admit, blessed readers, even now in my trenchantly Christian world of the eleventh century, we Anglo-Saxons do still like to pay tribute to our Germanic notions of commitatus and honour through brave deeds. I’m sure, by way of example, you’ve read our most famous poem Beowulf, written down around the year 1000, which, one has to admit, tends to foreground warrior might and loyalty between men rather more than any notion of personal salvation by the Almighty – though He does get a mention now and then. And though the naughty heathen bits and the manifest desire for gold in Beowulf are filtered through the Christian lens of the poet (so Dr Monk informs me), we all still get rather wrapped up in the heroism of mighty Beowulf. Well, at least at our monastery we do. And then we have the poem Genesis (which is actually two poems mashed together), found in the tenth-century manuscript known as Junius 11. The so-called Genesis B part does arguably paint God, our Creator, as a Lord with retainers. Likewise, the beautiful poem The Dream of the Rood, preserved in the tenth-century Vercelli Book, presents Christ as a heroic lord conquering death. Oh, you can't beat a mighty warrior! So to where does this discussion lead me? Where’s the promised spiritual succour, I hear you ask. Well, please don’t inform the bishop, but I thought it might be rather a treat to substitute the Germanic version of the Beatitudes for the Lord’s take on blessedness, which he delivered, as you know, in his Sermon on the Mount. I reckon that as long as you promise to faithfully read the original in your bibles afterwards (Matthew 5:3-12), then you won’t be going too far off the straight and narrow. So enjoy, and simply take it all in the spirit it is meant: the heroic spirit of Christian compromise. *James C. Russell, The Germanization of Early Medieval Christianity: A Sociohistorical Approach to Religious Transformation (Oxford University Press, 1994). From George Fenwick Jones, Honor in German Literature (1959), pp. 40-41. Image: A warrior angel of the Lord sends his spears to slaughter the enemy. 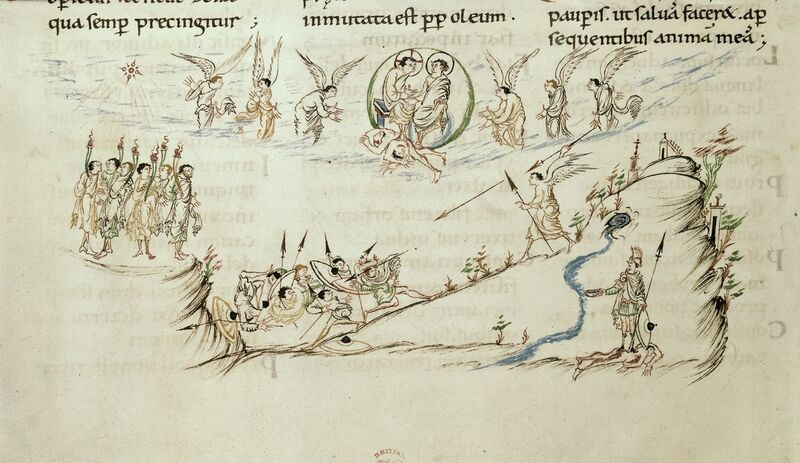 The Harley Psalter, Psalm 109. (Harley 603, fol. 56v, detail: Christ Church, Canterbury, first half of the 11th century.) Public Domain: identified by the British Library as free from any known copyright restrictions. Click on image to go to source.